These wooden blocks by Tinkerton are simple, beautiful, and timeless. Use them to work on grasping and releasing, stacking, and eventually learning letters, numbers, and even spelling. If baby is too young to play with them they can serve as lovely decor in a nursery in the meantime. Pull on Hug and Tug Musical Bug to watch him slowly move back up as he plays music. Love that he teaches cause and effect, promotes motor skills, and encourages attention. These ice creams are adorable scented baby teethers. The ice cream part is softer and the cone is firmer to provide different sensations. They can also be used for pretend play. This baby mat is super soft and cuddly, perfect for tummy time or play time. It comes in a variety of animals and colors to choose from. Use this toy as a drum or roll it around to hear it play an upbeat melody. Drums are a great way to encourage using both hands at mid line and teaching cause and effect. The Magic Reflection Ball is a unique shape that keeps the reflection changing as a baby explores and plays with it. It has a built-in rattle and a suction that sticks to tables, walls, and floors. It’s perfect for holding a baby’s attention while working on tummy time. 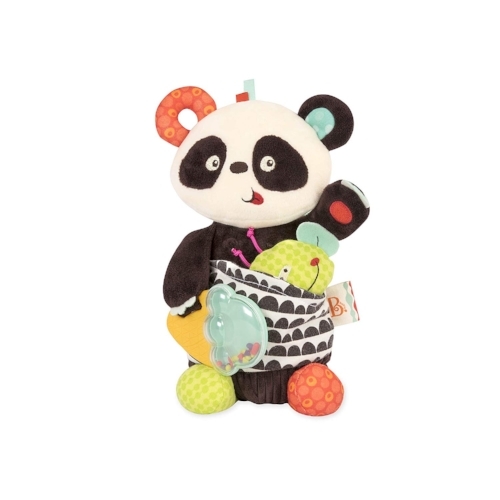 Party Panda Stuffed Animal comes with different textures and parts that crinkle and jiggle, a vibrating tail and a pocket for his little friend. Clip him to a stroller, crib or high chair. Mobiles are great toys for babies because they encourage visual exploration and attention. The high contrast colors are great for babies’ visual development as well because babies have an easier time seeing them. This extra large baby rattle is soft and easy for baby to grasp and shake. It can also work as nice sensory teething toy and play companion. The Baby Newspaper a fun sensory toy that helps develop fine motor skills. Squeeze, pinch, and crumble it then watch it bounce back to it’s original shape. Sophie La Giraffe is a stuffed animal that includes a variety of activity toys (a rattle, squeaker, crinkle, and mirror). So cute and fun for a baby to explore. 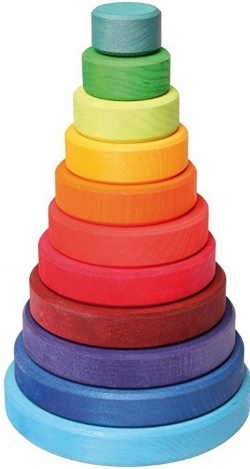 This beautiful wooden stacking toy is timeless with endless open ended play opportunities. Use it work on eye-hand coordination, fine motor skills, color recognition, size comparisons, and more. Oombee Cube is a rubbery shape sorter and teething toy in one. Playing with it encourages problem-solving, fine motor skills, and use of both hands together. It’s also perfect for on the go because the pieces are attached and won’t get lost. This organic activity toy is handmade with high contrast colors. It includes a variety of activities for baby to explore without being overly stimulating. Baby Einstein’s Sea Dreams Soother helps baby fall asleep by playing white noise and gentle soothing melodies. This play mat is specifically designed for baby to use and stay engaged during tummy time. It includes a variety of activities to explore and a prop pillow for additional support when needed. Slumber Buddies play gentle melodies and project lights to help relax and calm a baby to sleep. It comes in a variety of soft and cuddly animals to choose from. This animated Flappy the Elephant plays Peek-a-Boo and sings “do your ears hang low?” as he flaps his ears to the music. He’s also absolutely adorable and guaranteed to keep a baby engaged in play. This wooden rattle toy is beautiful and intriguing for babies. The beads are attached with an elastic and twist and turn easily, promoting fine motor skills, coordination, and attention. It can also be used for tactile exploration and teething.